Named one of the top charity wine auctions in the country by Wine Spectator Magazine, Destin Charity Wine Auction Foundation donated a record breaking $2.3 million to 14 Northwest Florida children’s charities. 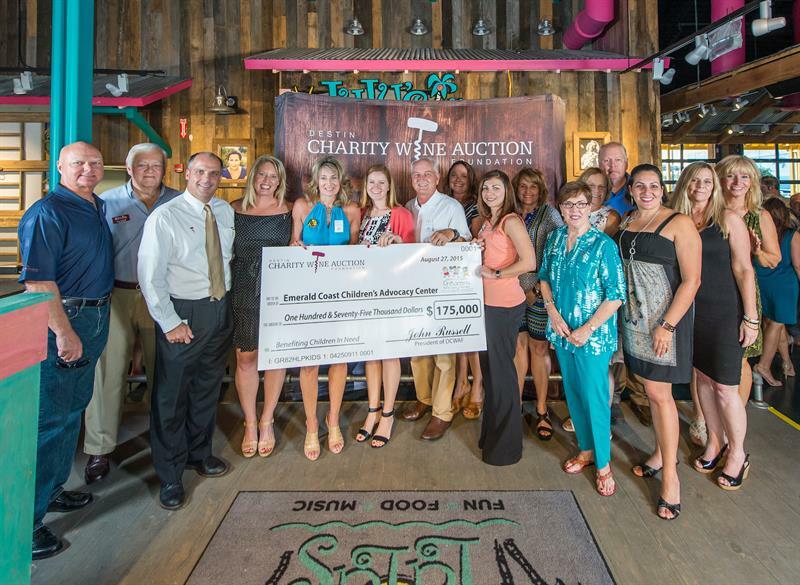 The private check presentation ceremony was held at Lulu’s Destin on August 27th, 2015, marking the Foundation’s largest charitable distribution to date. Celebrating its 10 year anniversary, DCWAF has now donated more than $10 million to non-profit organizations to serve children in Northwest Florida. This year’s results are an increase over the $2.035 million raised last year. 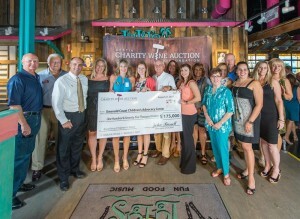 “This is by far the best day of the entire year for all of us at Destin Charity Wine Auction Foundation. We are forever grateful to our supporters who are helping to change the lives of so many children in our community.” – John Russell, president of DCWAF. In addition to funding the 14 local charities, DCWAF has realized a long held dream to create a fund for future needs. The DCWAF Children’s Fund is cash held in a separate account available to any of the DCWAF charities who have an emergency need. AMIkids Emerald Coast received $75,000 to offer a supportive, structured learning environment for high risk youth through off campus activities and other venues designed not only to teach but to gain respect and trust for their community. Boys & Girls Clubs of the Emerald Coast received $100,000 to allow 100 children across four counties to attend programming for one full year. The programing is designed to provide unique opportunities to learn, grow and to recognize youth for their achievements in an effort to steer youth clear of personal failure. Children in Crisis received $220,000 to fund housing for abused, neglected and abandoned children. The new DCWAF Travis Tringas home is expected to be open this fall and will provide stability, shelter, house parents, food, clothing and necessary items to help children live a healthy lifestyle. Children’s Volunteer Health Network received $190,000 to fund and serve more than 1,000 under-insured and uninsured children in need of dental care. These funds will fund operations for the Dental Bus, Dental Clinic and staff needed to assist with children in need of dental and medical care. Emerald Coast Autism Center received $200,000 to fund scholarships and capital campaign purchase of land and facility construction to serve children on the autism spectrum. The new NWFSC Campus Facility will allow Emerald Coast Autism Center to increase their capacity levels, serving up to 130 students. Emerald Coast Children’s Advocacy Center received $175,000 to support the mental health therapy and case advocacy program for children that have suffered from abuse and neglect. Funding will also aid in construction costs for the new Walton County facility. Food For Thought received $125,000 to provide nutritious meals for school-aged children on weekends, holidays and summer break. The fund this year will allow Food For Thought to expand into new areas and serve more than 1,000 children during the school year. Habitat for Humanity of Walton County received $162,000 to fund the building of two new homes for families with children. Okaloosa Walton Homeless Continuum of Care/Opportunity Inc. received $75,000 to support the children services department, including children’s coordinator, educational supplies, outdoor classroom, field trips and child care. Pathways for Change received $220,000 for comprehensive addiction treatment programs including men’s residential treatment and operations for the family center. Sacred Heart Hospital on the Emerald Coast received $225,000 to fund the expansion of the Neonatal Intensive Care Unit which will provide a larger nursery to accommodate a 10-bed Level II Neonatal Intensive Care Unit in the future. Shelter House of Northwest Florida received $165,000 to fund support groups, counseling and advocacy for youth ages 6 months to 17 years, touched by domestic violence. Youth Village received $140,000 to fund capital campaign purchase of land and facility construction and after-school programming for more than 40 low-income children along the Emerald Coast. The Arc of the Emerald Coast received $180,000 to complete expansion and renovations of the Children’s Center, transportation an aquatic center for children living with disabilities. DCWAF Children’s Fund received $48,000 that will serve as a contingency fund for charity partners and will be used as a safety net to serve children in need in the event of an emergency. “In 2013, Food For Thought was working out of a borrowed, 200 square foot closet with one employee, and serving 125 children each week. Thanks to DCWAF and others, we have since expanded to 15 schools, are now K-12, have a full time staff, acquired an operations facility and we reach nearly 800 students each week with an expected enrollment of at least 1,000 during the new school year.” – Tiffanie Nelson, executive director and founder for Food For Thought. The dates for next year’s Destin Charity Wine Auction Weekend, the Foundation’s signature fundraising event, are set for April 28-May 1, 2016. Learn more at www.DCWAF.org. Destin Charity Wine Auction Foundation connects wine enthusiasts to raise money to benefit children in need in Northwest Florida. Founded in 2005, Destin Charity Wine Auction Foundation (DCWAF) has donated more than $10 Million to Northwest Florida charities through hosting world class wine and culinary events. These funds have impacted the lives of over 60,000 youth, including those afflicted by health issues and abuse. DCWAF is recognized as one of the nation’s ‘Top 10 Charity Wine Auction in the U.S.’ by Wine Spectator Magazine, ranked No. 4 in 2014, No.6 in 2013, and No. 10 in 2012. Learn More at DCWAF.org or facebook.com/DCWAF.